Barcelona’s Lionel Messi celebrates after scoring the opening goal during the final of the Copa del Rey. Barcelona’s Lionel Messi, celebrates with Dani Alves after scoring in the final of the Copa del Rey. This Saturday, the magisterial Lionel Messi will lead FC Barcelona against Italian powerhouse Juventus in the UEFA Champions League final. For you non-cosmopolitans, this is like Messi’s Super Bowl — if more people watched the Super Bowl.1 After winning La Liga last month and the Copa del Rey2 last weekend, Barcelona is poised (and favored) to give Messi his second “treble,”3 which would make it the first European squad to accomplish the feat twice. 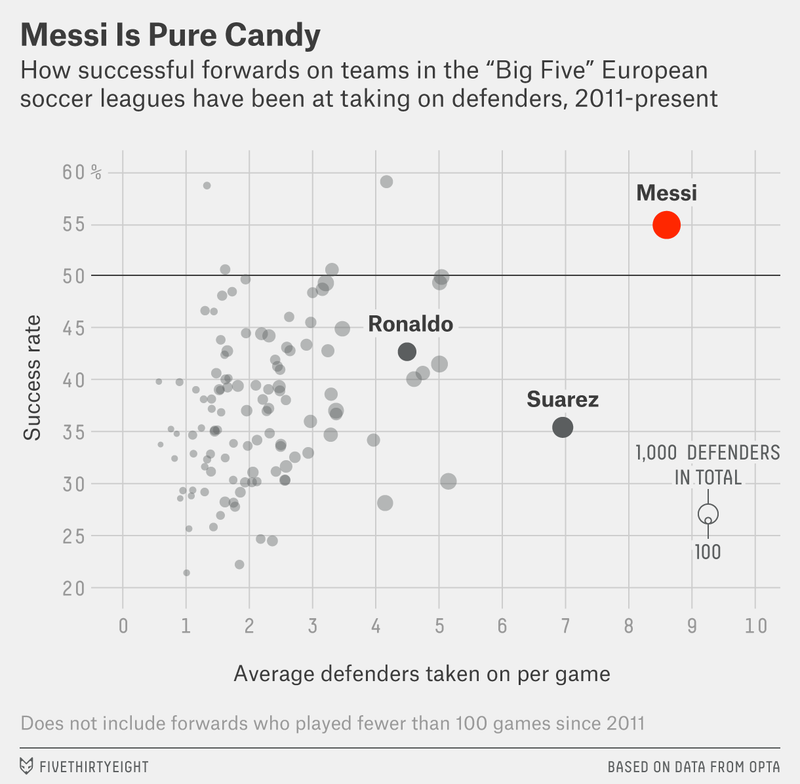 That Messi is once again on the precipice of glory isn’t entirely unexpected considering his talent and reputation. But not long ago, it seemed far from a sure thing. Messi’s 2014 World Cup performance was somewhat disappointing and even a little strange. Despite winning the Golden Ball (controversially) and leading Argentina to the final before succumbing to Germany in overtime, he only facilitated one goal (albeit on a game-winning assist) in the knockout rounds and curled a potential Cup-winner wide. By the end of the tournament, Messi’s bursts of brilliance were accompanied by the spectacle of him often strolling or even standing still on the pitch — he covered the least distance per minute of all forwards in the tournament. Was he exhausted? Or was he playing some bizarre metagame? A disappointed Messi returned to an uncertain situation with his club team. Barcelona was under new leadership, and despite already having Messi and Brazilian megastar Neymar, it acquired English Premier League (EPL) standout Luis Suarez as well. Although Suarez is now an essential member of the “holy trinity” of Barca forwards, it was unclear what all this meant for Messi at the time. Some wondered if Messi’s best years were behind him, and with many seeing Neymar as the future, rumors spread that Messi might be transferred to Chelsea or some other EPL squad. Barcelona started the season strong, but it lost its most important first-half test — taking a 3-1 beating at Real Madrid — Cristiano Ronaldo’s Real Madrid. Messi failed to score or assist in the game. When Ronaldo won the Ballon d’Or for the second year in a row, the choice wasn’t even controversial. Oh how far we’ve come in a few short months. Messi’s season — once mired in disappointment and doubt — has turned unambiguously triumphant. Regardless of what happens this weekend, Messi’s 2014-15 season weaves together aesthetic achievement, statistical accomplishment and compelling narrative into a tapestry of genius. During last year’s World Cup, I wrote “Lionel Messi Is Impossible” — a casual ditty of over 5,000 words and 15 charts — so I could wrap my head around something that my eyes already knew: This little dude is unreal. In that incredible run, Messi takes on a defender close to midfield, finding space down the sideline. Two more defenders descend, and Messi takes on — and beats — all three. Yet another defender gets in front of him, with two more rapidly approaching as he breaks left and curls it in past everyone (the person who appears to have come closest to derailing the play is teammate Suarez). In the past five years, Messi has taken on defenders one-on-one (or one-on-more-than-one, as in the Copa) 1,995 times, with 55 percent of those succeeding. The forwards with the next-most attempts are Suarez with 1,113 (success rate of 35 percent) and Ronaldo with 872 (success rate 43 percent). In the 2014-15 season, Messi has taken on defenders even more often (averaging 9.6 attempts per game vs. 8.3 in the previous four seasons) without sacrificing his success rate (56 percent vs. 55 percent). Statistics inform aesthetics (and vice versa). In this case, the statistics help us understand the scope of what we can see already: It’s not just that Messi is good, but that he plays the game a whole different way. Messi’s 2015 success has brought narratives of resurgence, redemption and maturation. His statistical accomplishments inform those narratives, although I believe they ultimately lead the story somewhere slightly different. Let’s look at the ongoing saga of Messi vs. Ronaldo. At the year break, each had 32 goals plus assists for their club teams (not counting penalty kicks4). But what had been a tight battle then started going more and more Messi’s way. 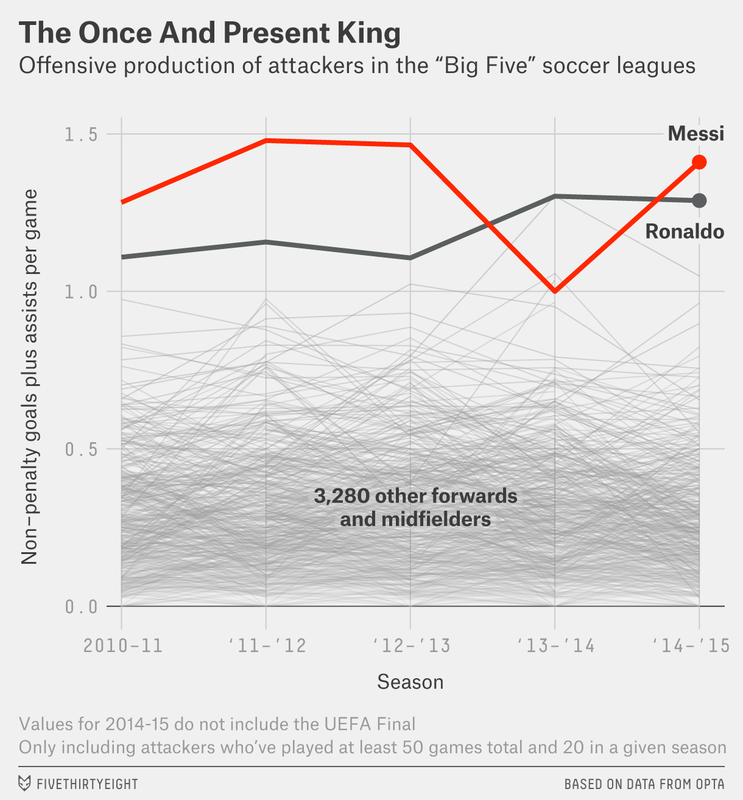 For the most part, Messi’s brilliance in 2015 is just a linear extension of his brilliance in 2014. 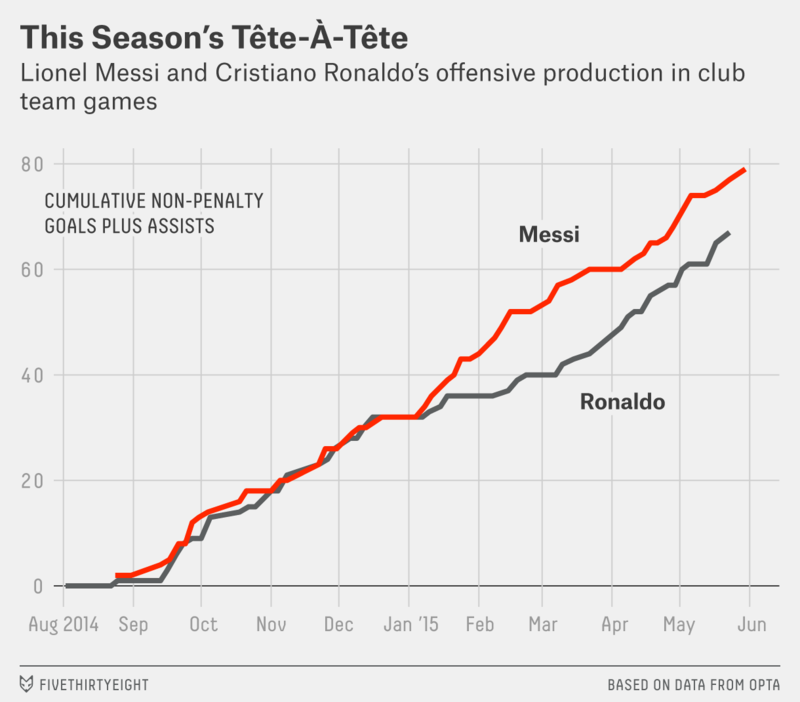 The separation from Ronaldo is more a product of Ronaldo’s slightly flatter production. On the other hand, insofar as we have created statistical metrics to compile and measure our observations, they pretty much side with Messi: He scores more goals, shoots more efficiently, gets more assists, passes more aggressively, passes more accurately, and more. For more detail on the subject, I would again direct you to my longer piece from last year. The 2014-15 season changes little. If anything new has developed, it may be that Messi’s defensive contributions are greater than ever. Messi has 40 tackles this season with a tackle rate of 58.8 percent (high for a striker), compared with Ronaldo’s 10 tackles and 38.5 percent rate. Messi also had 16 interceptions to Ronaldo’s four.5 While defensive stats in soccer are limited, what we do have for Messi was already perfectly adequate for a high-volume striker, and for 2014-15, his “defensive plays made per opponent possession” is now in the upper echelon of his cohort. Aside from his injury-affected 2013-14 season (which was still pretty great), Messi’s otherworldly production has been rather consistent. Despite the drama and protestations and the thousand Internet discussions, the most remarkable thing we’ve learned in 2015 is that Messi is pretty much as he ever was. 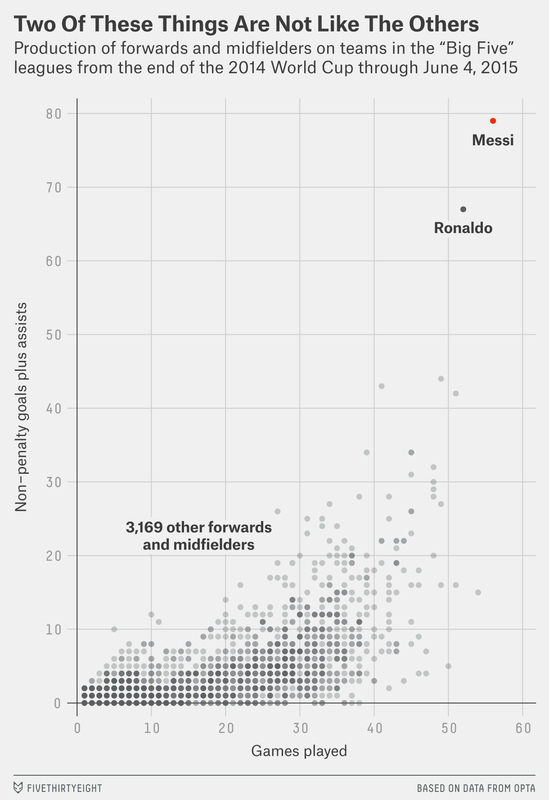 That may not sound like the most thrilling observation, but when you’re as big of an outlier as Messi, staying the same is amazing in itself. Although the data mostly suggests that Messi is just being himself, the revenge narrative that has emerged is enticing, and not even the most cold-hearted stat-geek can resist it. In addition to reclaiming his statistical throne from the man who usurped him as the official “best player in the world” by winning the last two Ballon d’Ors, Messi led Barcelona to victory against Real Madrid in Camp Nou, 2-1.7 Unfortunately, Real Madrid lost to Juventus in the Champions League semifinals, denying us the ultimate rubber match. The opposition on that goal: the same two guys Messi faced on his missed potential Cup-winner, all-world goalkeeper Manuel Neuer and Jerome Boateng. Messi’s performance against Bayern was a master class in what makes him so good. In addition to his two goals (one from long range, one that put a defender on the ground), Messi also had three successful through ball passes in four attempts (including on this cringe-worthy Suarez miss). In the past year, Messi has attempted through-ball passes more than twice as often as any other player and has had twice as many assists from them as a result (and he has been doing that for years as well). For a 10 minute distillation of Messi greatness, watch this 10 minute supercut of his touches from that game (and watch for the through-ball attempts — they can be just as impressive as goals). It’s Messi being Messi. And the fact that Messi is still Messi may just be the most beautiful thing in sports. Although claims of worldwide television audience can often be exaggerated, the UEFA final is one of the few events (along with the World Cup) to actually, regularly outdraw the Super Bowl in TV viewership. Spain’s national cup. Sort of like the playoffs for Spanish soccer, except it runs throughout the year. Although there are a lot of “treble” scenarios, it mostly requires that a team win its league (in this case, La Liga), its country’s national cup (in this case, the Copa del Rey), and its continent’s inter-league championship (in this case, UEFA for Europe). Note that Juventus is also playing for a treble. Note that Ronaldo is historically a little better than Messi at PKs, but the value of this skill (as I’ve previously estimated) is perhaps 1 goal per year at most, not the several goals that may separate them any particular season. Ronaldo continues to dominate Messi in clearances (he has 42 to Messi’s one) and aerials won and aerial win percentage (78 to 16 overall and 52.3 percent to 34.0 percent). That third line, which managed to match Ronaldo at its peak last season, is Suarez. On a lighter note, Messi has presently moved in front of the usually-dominant Ronaldo in that most important of metrics, Google searches.